We are very proud that we started at Jack's Camp in Botswana with spa treatments and Yoga. Jack’s Camp is one of the most iconic and celebrated camps in all of Africa. Situated on the edge of a vast saltpan, the remnants of a prehistoric super lake, the camp’s striking, otherworldly setting invokes the savage beauty of a long-forgotten Africa. A visit here may be as close as you’ll ever get to feeling that you’re on a different planet. 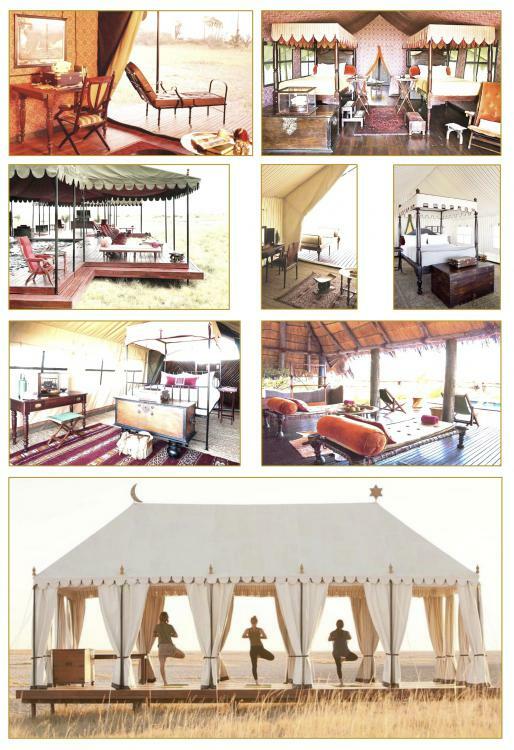 The camp is an oasis of comfort and style in midst of the Kalahari. Jack’s Camp is all about surprises. First, there is the camp itself, which consists of luxurious and stylish old-world tents, complete with bhukara-muslin draped walls, Persian rugs, and vintage lithographs, as well as a private museum, a swimming pool pavilion and a decadent tea tent. San Camp offers a refuge of comfort and civilization in a beautifully austere desert setting. The camp, with its six guest tents, is situated on the edge of the vast and mysterious Makgadikgadi Salt Pans, the remnant of an extinct super lake that once covered most of Botswana. The area is so vast and open that you can literally see the curve of the Earth! The camp’s classic white tents are majestically perched on the shore of the sparkling saltpan, each sheltered by a cluster of stately desert palms. The camp exudes minimalist safari elegance and is undoubtedly one of the most unique and romantic camps in all of Africa. Camp Kalahari is a laid back base for your desert experience. Set amongst the palms on Hyena Island, Camp Kalahari is where the action is. It’s not uncommon to sit down at the dinner table while the famous black-maned lions of the Kalahari roar nearby, or to doze off while listening to the sounds of elephants feasting on palm nuts just outside your tent. This traditional bush camp has ten spacious Meru tents with en suite bathrooms, hot and cold running water, and flush toilets. Common areas include a thatched central library; a living and dining area featuring an eclectic mix of original African furniture and textiles, and colonial antiques; and a thatched swimming pool – the perfect place to cool off on a hot afternoon. We will offer all kind of massage treatments, facials, mani's and pedi's and in a later stage yoga. We will also start at Meno a Kwena with spa treatments in October 2018. This beautyfull is a camp, a hidden gem perched on a rocky clifftop above the Boteti River in Botswana. Wildlife viewing in front of your tent. Treatments with a view over the river, do you want more? Last year Prins Harry and his wife Megan also visited Meno so whats more to mention. So indeed we are very proud.